You will love these chairs! Best is for you to visit my shop….or call, write, email. You’ll find that information at the bottom of this (and every) page. You can see a complete price list by clicking here, and also check out the form below to see chair styles and cost estimates. 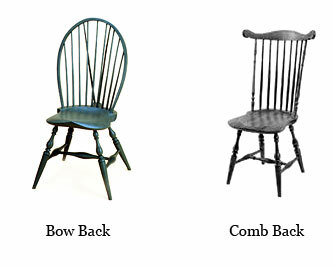 Are you interested in Windsor chairs, benches, or other furniture? Windsor chairs Settees and benches Coffee tables and stools Check all that apply. An overview of the Windsor furniture available can be found here. 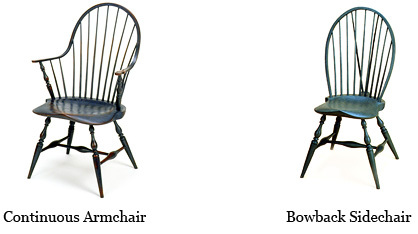 What type of chair are you interested in? Which style of arm chair? Which style of side chair? 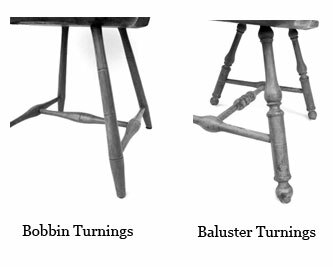 What style of chair legs do you prefer? Would you like back braces included on your chair? Would you like rockers on this chair? Would you like your chair finished with traditional milk paint? Is this a settee for two, or a settee for three? What style of settee legs do you prefer? Would you like your settee finished with traditional milk paint? I create all sorts of Windsor furniture. You can see some pieces in the gallery. Here are some of my more popular designs along with prices and options. Would you like this piece finished with traditional milk paint? Would you like me to contact you about this estimate?